I pause amidst my Saturday gyrations for a Scattered Saturday post. It’s going to be a quick one, too, because I am frying sausage and it does not do to neglect these things. My wonderful husband, Steven, had a rare day off, so we wanted to spend at least some time having a few minor Mohawk Valley adventures. Accordingly, we got an early start and headed to Utica to the So Sweet Candy Cafe for their open house. Heading back to Ilion, we went to Honey Brook Hobbies, Ilion Wine and Spirits, and Original Herkimer Cheese. I can do blog posts about all these things, and I hope to in the coming days. Before and after our adventures, I wrote out a few more Christmas cards. Alas, I was not in time to get them to the post office before it closed. It was, in fact, a little cold to walk to the post office, much less go running. I daresay I should not have let that stop me had I been on my own for the day. Perhaps a walk to the post office tomorrow, or even later today and look at other people’s Christmas lights. And what about a run, you may ask. Well may you ask! I confess, after the Reindeer Run 5K, I once again fell off the running wagon. I did not mean to, but, well, these things happen. Now I begin to repeat to myself the mantra: If you are too busy to exercise, you are too busy. Substitute “lazy” for “busy,” though. Sorry folks, but there it is. I set a bad example. But here I am approaching 300 words. Doesn’t that set a good example for making a blog post every day? Oh well, given the general quality of my posts, perhaps not. Then again, some people find them amusing. For those who do not, there are other blogs to read. Happy Saturday, everyone. Posted in blogging, humor, personal, Scattered Saturday and tagged bad example, blog post, Honey Brook Hobbies, Ilion Wine and Spirits, local businesses, Original Herkimer Cheese, Reindeer Run 5K, running, So Sweet Candy Cafe. Bookmark the permalink. 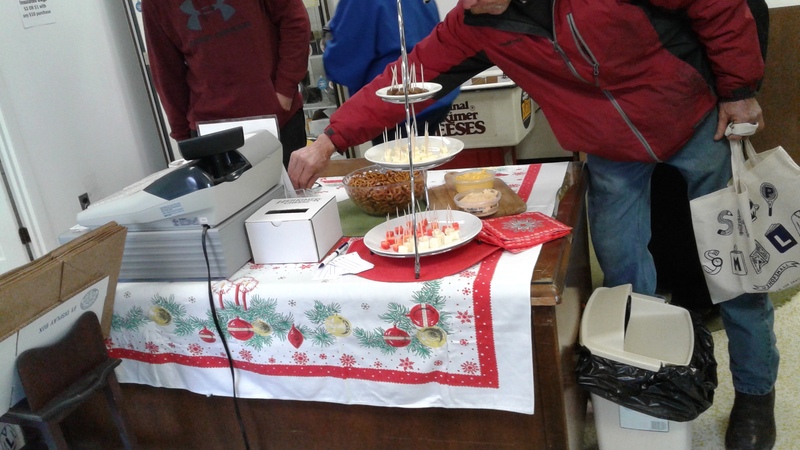 One of my favorite stops on Shop Small Saturday was Original Herkimer Cheese in Ilion, NY. I had first tried Herkimer Cheese at a wine tasting at Ilion Wine and Spirits (just to plug another local business). I was delighted to discover another local cheese maker. I went home and Liked them on Facebook. Fast forward to November 2016, when I learned they were having a Holiday Open House. It was not hard to find the place, out Otsego Street a little beyond Ilion Farmer’s Market (another favorite destination). I walked in to find several people enjoying free samples and chatting. I happily tried some Chutter and Cheddar as well as two kinds of cheese dip. One of the ladies working (I foolishly did not ask their names) said she would be happy to open anything else people wanted to try. After looking in the cooler, I asked to sample the Asiago Bacon Horseradish dip. Yummy! I got some of that and some Buffalo Bleu Cheese dip. Just before turning away from the cooler, I noticed some garlic and herb cheese and grabbed that too. I was sure I would like something called “garlic and herb” without sampling it first. 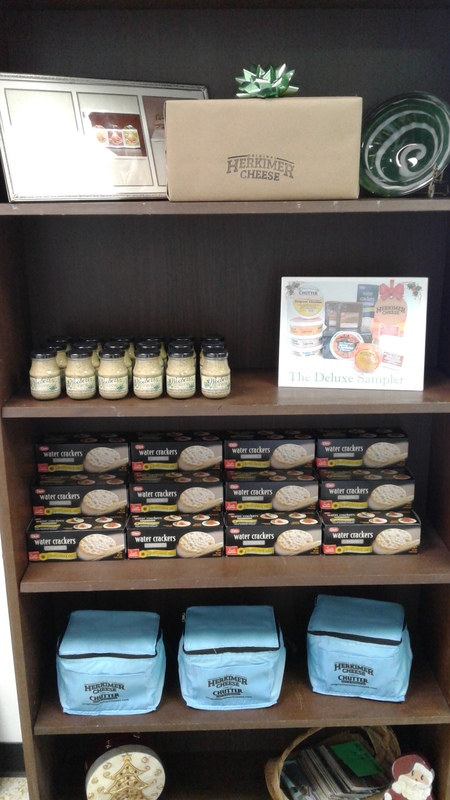 I looked around the room at some of the other wares for sale, especially noticing some mustard and crackers that looked good. I was very interested in the t-shirts that read “Keepin’ it Cheesy since 1949.” I mentioned that I like to eat cheese and watch cheesy movies. Everybody appreciated the double meaning. Maybe Steven will get me one for Christmas! I was happy with my purchases and happy I discovered another good place to buy cheese. 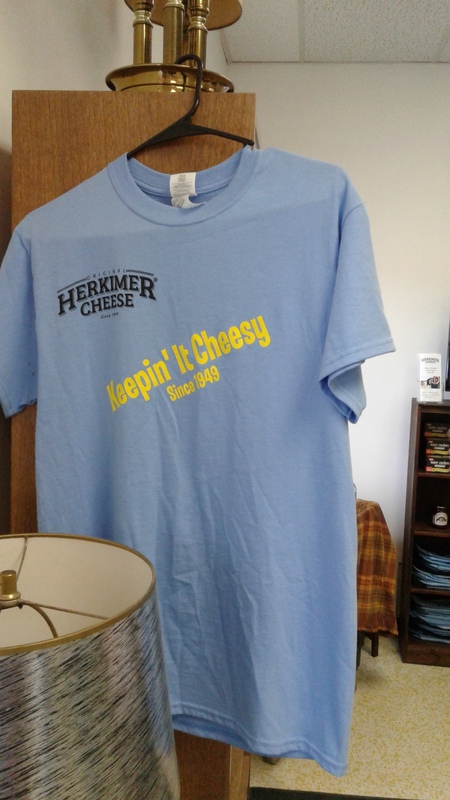 Original Herkimer Cheese is located at 2745 State Route 51, Ilion, NY 13357, phone number 315-895-7428. For more information you can visit their website at www.OriginalHerkimerCheese.com. Or you can stop by. I saw on Facebook that they are hosting another open house on Saturday Dec. 3 from 10 a.m. to 4 p.m. I might go there again myself! Posted in humor, local business, personal and tagged cheese, Ilion Farmer's Market, Ilion NY, Ilion Wine and Spirits, Original Herkimer Cheese, Shop Small Saturday. Bookmark the permalink.